The dParty as illustrated by Katie Flynn. 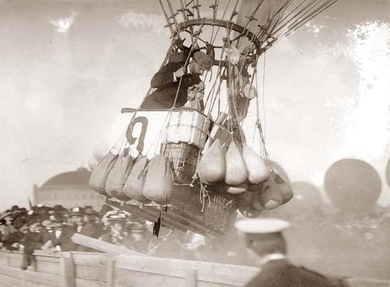 … to include all wearables and inflatable structures. 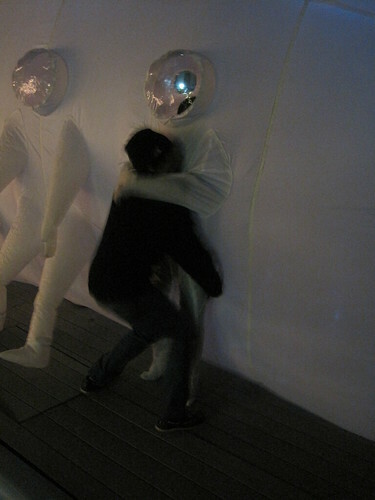 Along those lines, Brandon Roy and I have completed a new inhabitable inflatable structure. 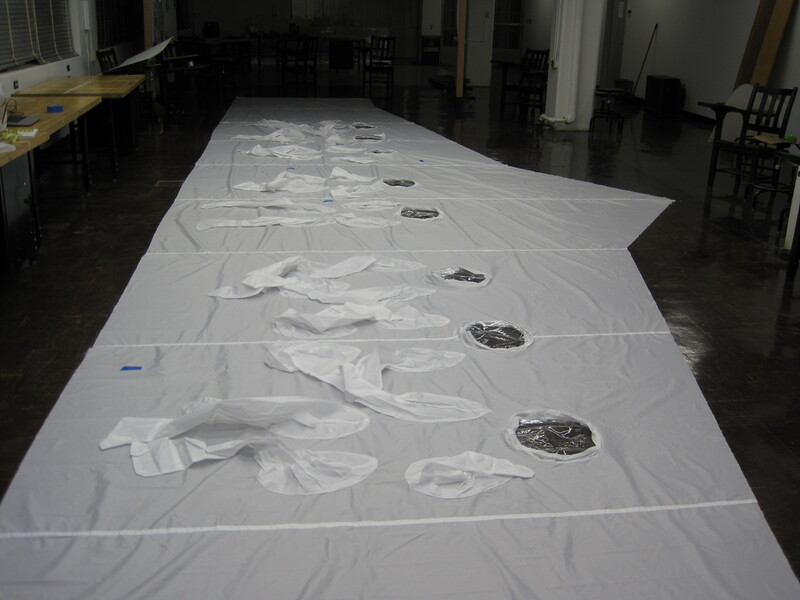 This one is our largest yet, spanning 30 feet in width and containing two chambers. 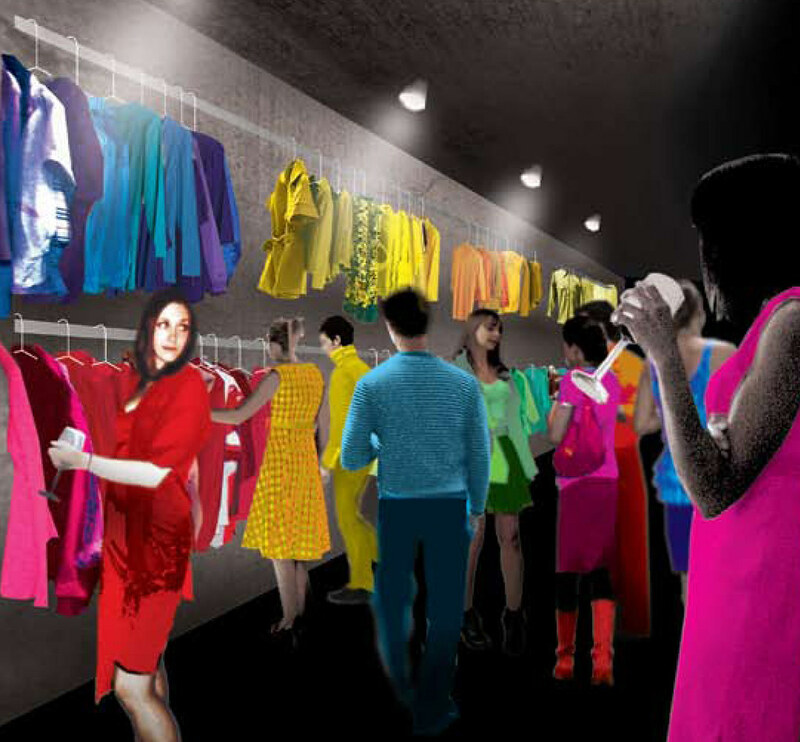 These chambers house dressing rooms for the upcoming Common Boston dParty taking place tomorrow night (Thursday, June 17) at the Artists for Humanity Epicenter. The event is open to the public, so long as you RSVP by 3pm tomorrow to get your name on the guest list! Come wearing head-to-toe monochrome, or rent an outfit from us in exchange for $10 or a 5 lb clothing donation to Boomerangs. 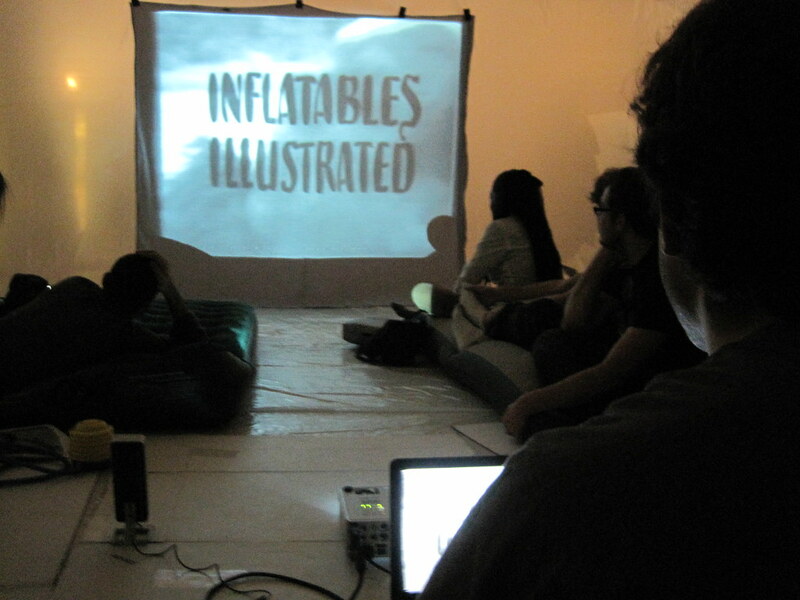 As mentioned, inflatable dressing rooms will be there to ease your costume change. See construction photos here. 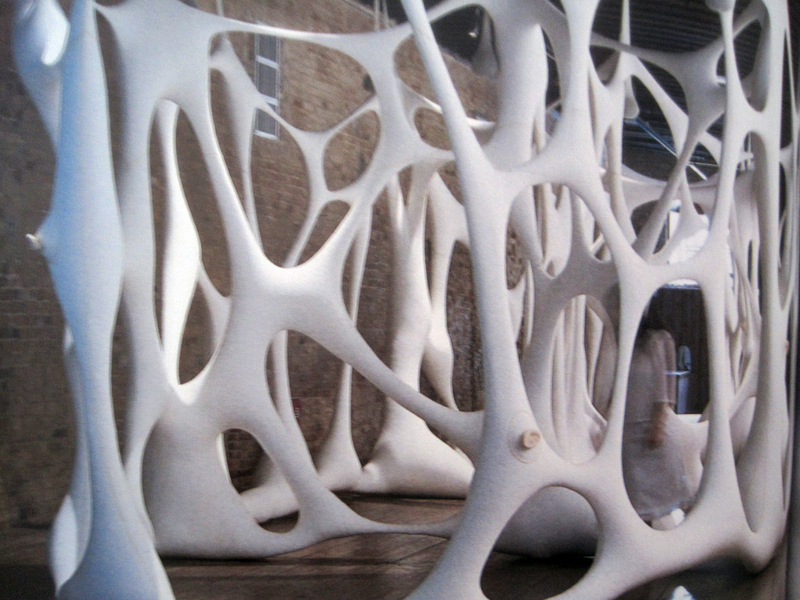 View into the model of an inflatable dressing room. 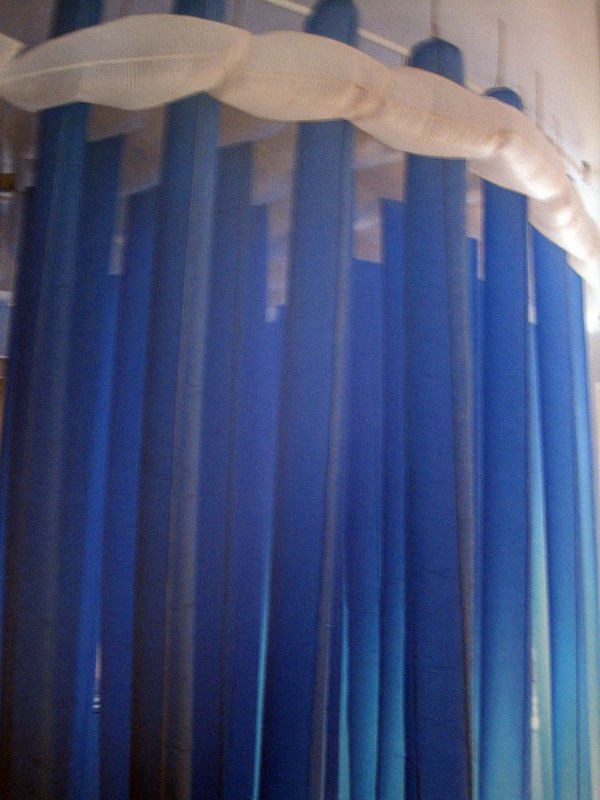 The design is extremely simple (thanks to Brandon), primarily involving one 15' x 75' sheet of plastic twisted to create the structure for two connected chambers. Click the photo to see the full set of construction photos on flickr. Lessons from inside the official class bubble. 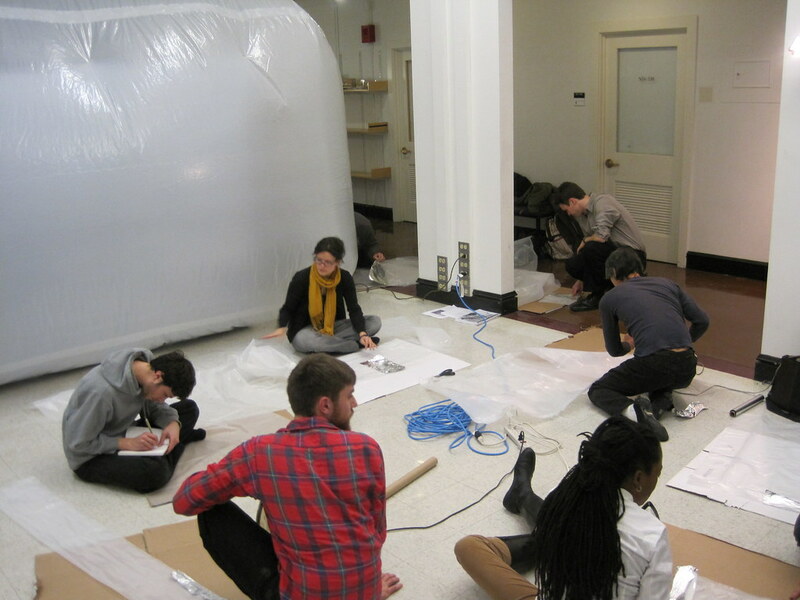 During the last two weeks of MIT’s independent activities period, Brandon Roy (MAS PhD ’11) and I led a workshop entitled MIT Bubbles: an intro to designing and building inflatable structures. 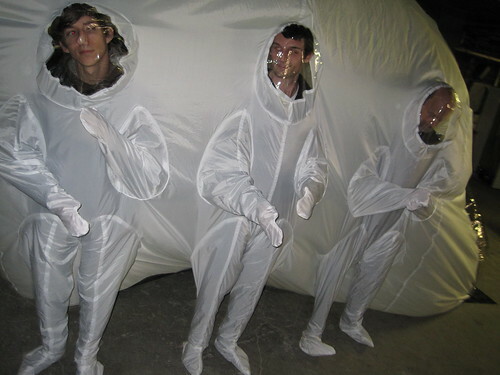 The first week took place inside of a giant inflatable structure, referred to as the “class bubble”. 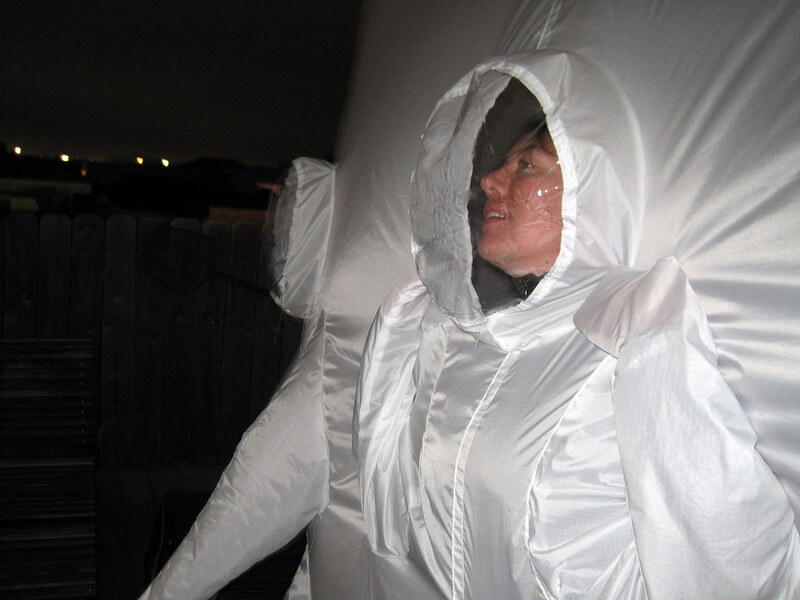 There participants learned about the history, theory, techniques and science behind inflatable structures. During the second week, students emerged from the bubble and built their own projects to display in a public exhibition on February 1. 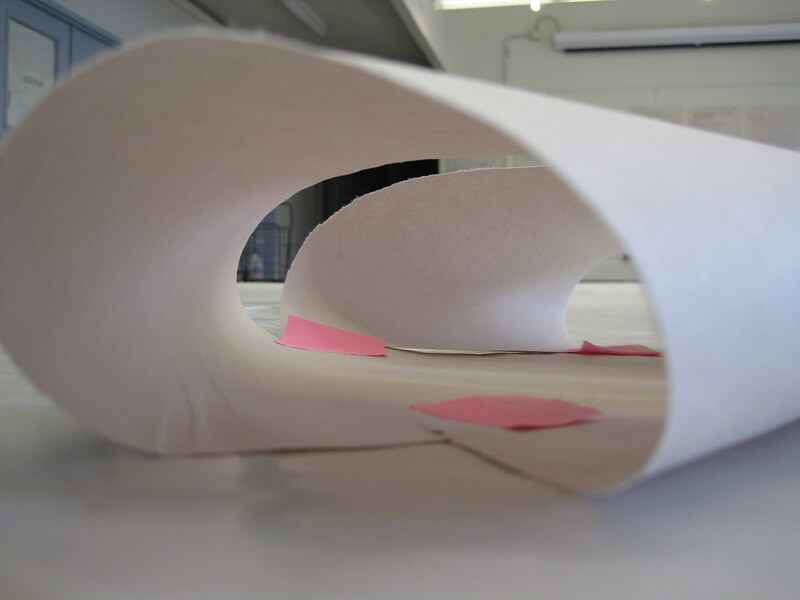 A few images of the projects by participating students will soon appear below. For a quick look and a visitor’s perspective, check out the slide show on the Boston 24 website. Mary Hale is still too tired to provide a play-by-play account of the five days that Itinerant Home spent happily installed in New Orleans during the DesCours festival. Thus, a short account with a few highlights and photographs will have to suffice. Itinerant Home spent half of the festival on it’s assigned site: the rooftop of the DH Holmes Building at 810 Bienville Street in the French Quarter. This site couldn’t have been more symbolically and aesthetically appropriate for its connection to the city, its proximity to water, is kitsch plastic wood decking… However, an unforseen problem surfaced on opening night: gale force winds threatened to blow the project off of the roof. One of my volunteer assistants wouldn’t even go inside for fear that she and the project would blow into the pool together. 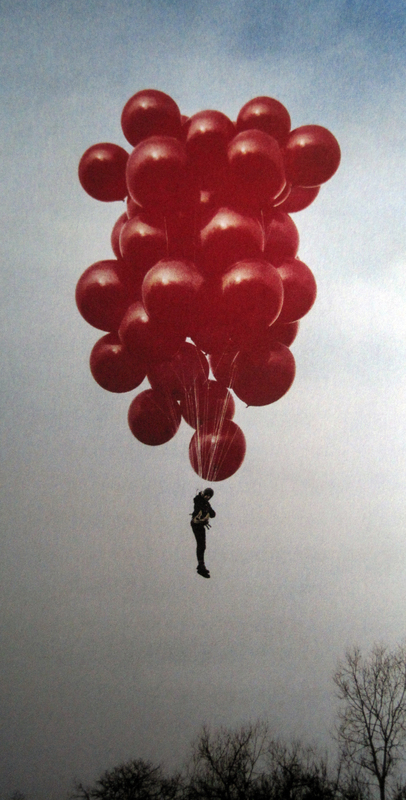 There she would drown, wrapped in deflated masses of unrippable ripstop nylon… She wouldn’t even enter after another assistant and I had moved a park bench inside, along with several tables… The roof inverted, and the house rocked violently back and forth. 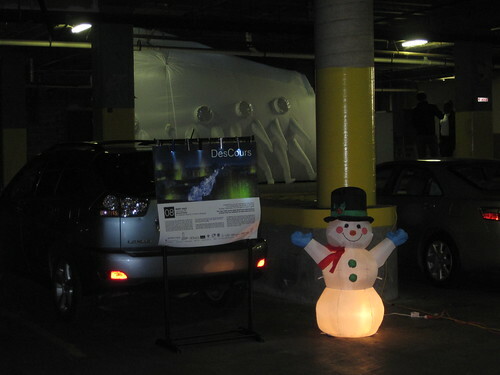 After thirty minutes we threw in the towel, and thanks to Itinerant Home’s portability we we were able to reinstall in two unassigned sites before semi-permanently squatting in the parking garage next door. The garage was filthy (as evidenced by the current condition of Itinerant Home’s feet), and its ceiling had a few low hanging barbs of re-bar (as evidenced by a small hole in Itinerant Home’s roof) and rusty pipes (as evidenced by a dark streak across Itinerant Home’s roof). Nonetheless, there was space in the garage for the project to roam freely, and it was thrilling to allow eight visitors to move the house all over the space simply by coordinating their steps — as choreographed once by myself and once by my lovely and helpful volunteer assistant, a Tulane medical student named Michelle. The next night, Itinerant Home, now anchored with sand bags and ties, by God, spent the whole night on its rooftop site. The site was enhanced by musical accompaniment provided by the Ed Barrett Trio. The feeling was grand, but it couldn’t last. 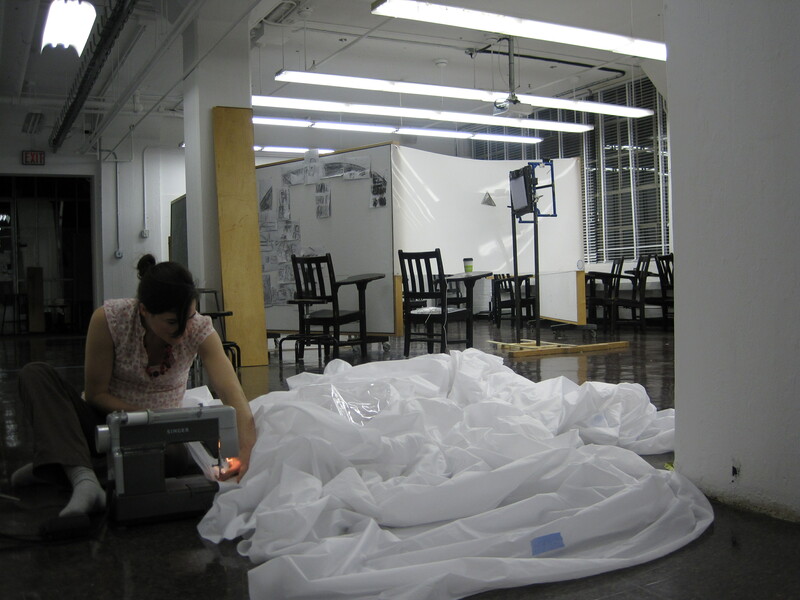 The two ensuing stormy nights of torrential downpours and winds sent Itinerant Home scurrying for shelter in the parking garage next door to her site yet again. The week was replete with exciting moments. Perhaps most notably, on Sunday December 13 around 8:00pm a marching band emerged from a thick fog on the rooftop of the DH Holmes Building. Following the band, nearly sixty drunken fans exploded into the pool area. Someone actually dove into the pool, head first fully clothed. Two women seemingly attempted (and half-succeeded) to rip hands off of two of Itinerant Home’s bodysuits with their drunken flailing. Doug MacCash, the New Orleans Times Picayune‘s Art Critic helped a guest secure Itinerant Home’s fan with duct tape. And although Mr. MacCash didn’t recount this moment, he did provide a kind word or two about the project here. A rainy night in the garage. Nylon enhances love-making. Or was that latex? Itinerant Home accommodates sitting, as well as, walking and dancing. The aforementioned garage... with low ceiling and filthy floors. Anyway… happy holidays. There will be more to come in 2010. 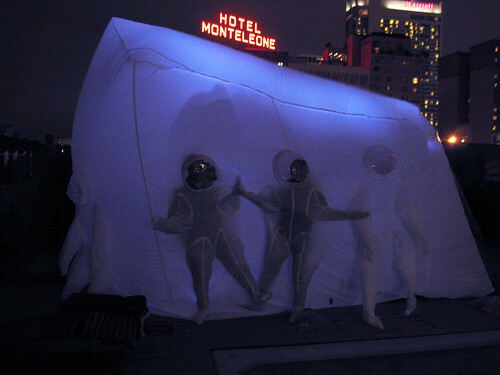 Installed and Inflated, the Itinerant Home will debut tonight on the rooftop of 810 Bienville Street, one block off of Bourbon in the New Orleans French Quarter. It’s been a whirlwind week with countless untold tales of sleeplessness, problem solving and insanity, but Itinerant Home is finally installed and working exactly as planned. 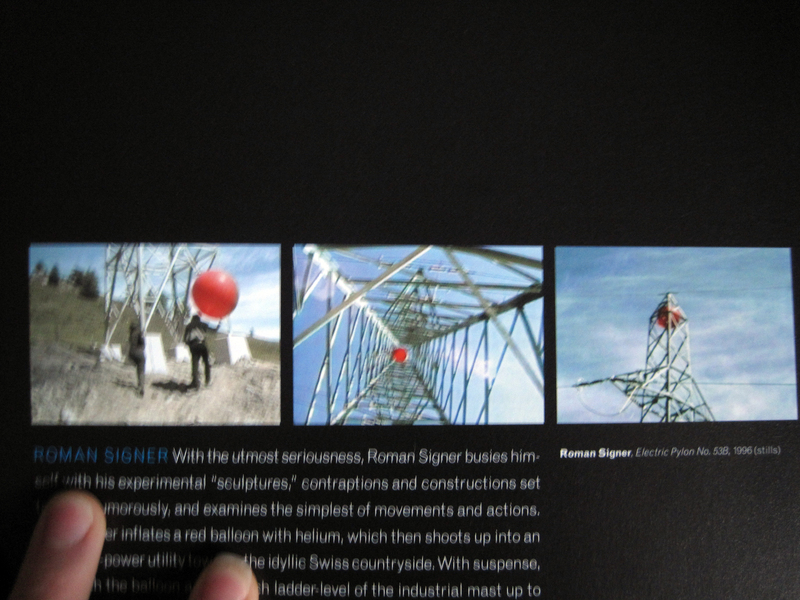 The project is installed in a location other than the one mentioned in a precious post. Now, it is on the fourth floor of 810 Bienville in the French Quarter. Click here for a map showing Itinerant Home’s site (number 8), as well as the sites for all 13 DesCours Installations. 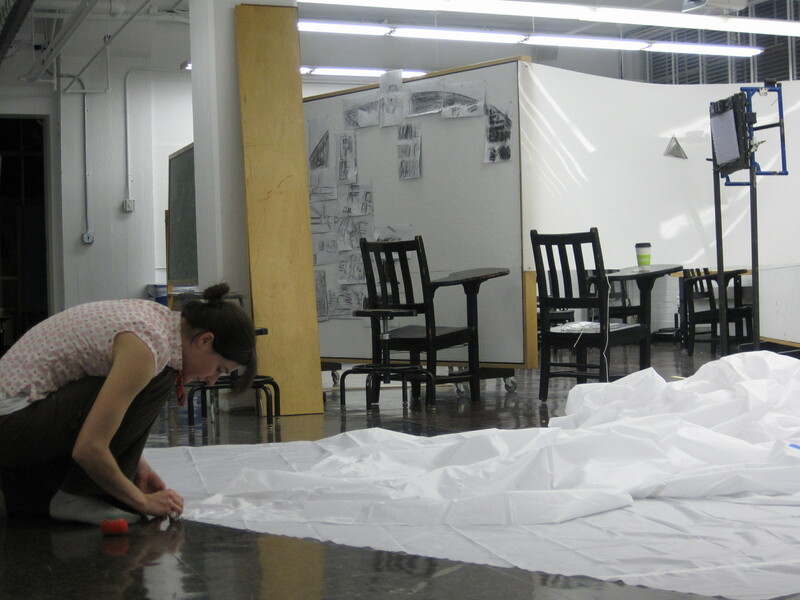 Tonight is opening night, but Itinerant Home’s big night will take place Thursday from 7 – 10pm. There will be a band and a crowd wearing the Home around the pool. It would be wonderful if you could make it! Carey Clouse, my wonderful hostess, modeling Itinerant Home. IT’S HAPPENING. Itinerant Home is slowly taking flacid shape. A couple of days ago: all body suits a go. Yesterday: all walls sewn together. Yesterday: all walls cut to their final heights. 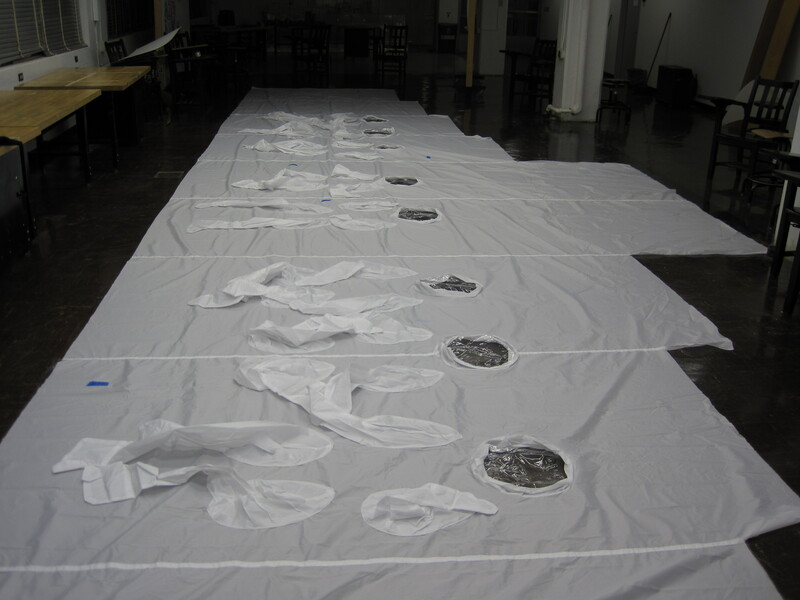 Today: Testing out a new floor-based seam-sewing method for extra long seams. Much better. Unflattering, however. 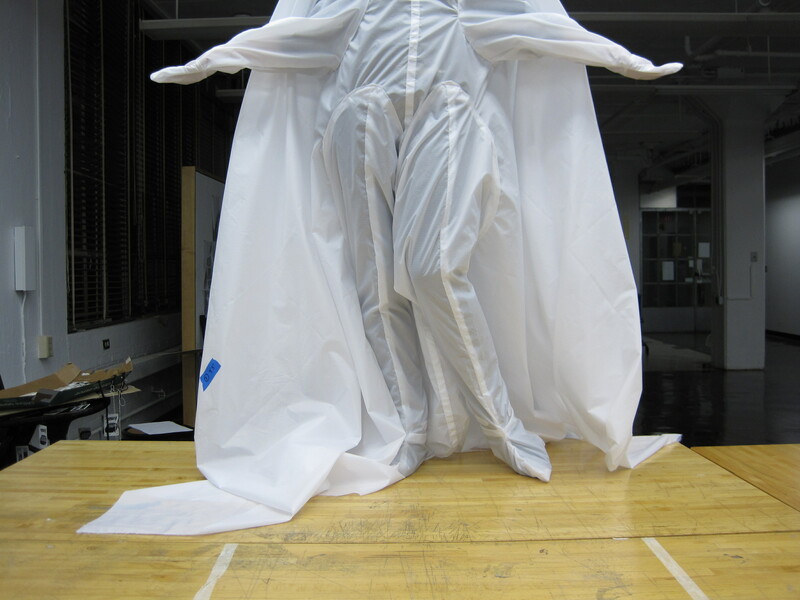 Today: Flacid and inside-out, this image tells you nothing about the project's final look (not to mention, feel). 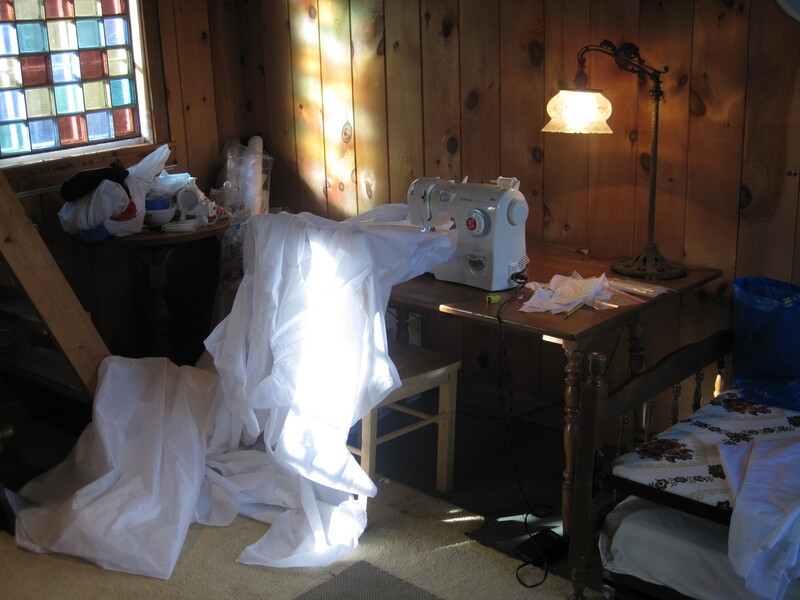 What this picture does prove, however, is that i finished sewing the roof to the walls. Next stop, floors, inlet and airlock. TOMMOROW. A 5 day respite in the Berkshires. 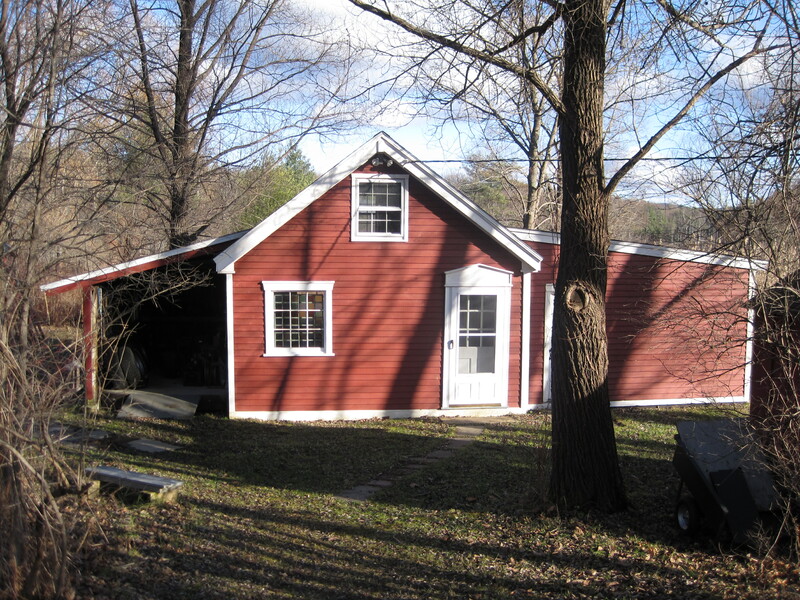 This little cabin was transformed into the Itinerant Home studio. Although Shrinking Cities have plagued the Rust Belt for several decades, the rise of natural disasters, growing foreclosures and a deepening economic crisis has fueled this effect throughout large and small American cities. This changing growth pattern calls for innovative design tactics; empty lots, forsaken buildings, a loss of density and irregular rings of development offer exceptional opportunities for meaningful design interventions. As communities look for new ways to integrate food production and localized fuel sources, useful infrastructure and changing lifestyles, this drosscape offers itself up as a panacea to the problem. New Orleans has become a testing ground for new and innovative design tactics, and the post-Katrina landscape offers a unique set of geographic, cultural and physical conditions for these efforts. Designers who work with this landscape must understand the issues that specifically affect shrinking cities, and the impact of this population loss on the environment, community, and built landscape. With just 77% of its pre-storm population, a 50% average increase in rents, and over 60,000 vacant homes or empty lots, housing, density and land use have become major factors in the redevelopment of New Orleans. Though troubling, these statistics provide designers with real parameters for retooling the landscape. For better or worse, New Orleans has become the target of innovative and sustainable design work, ranging from bioremediation efforts to re-casting the subdivision, scattered-site farming to local power generation strategies, land banking and radical community building efforts. Many thanks for the insights Carey. Keep up the good work! On a side note, I already miss this little sewing table. Thanksgiving is a time to read and reflect on the things for which we are grateful. Thanks to Carin Kuoni and the Independent Curators International for putting togethether such an inspiring exhibit. I highly recommend its catalog, where many of the following images appear in much higher resolution and quality accompanied by fascinating essays and critical theory. I’ve taken the liberty of making a few of my own curatorial additions, as well. Those are noted as such. 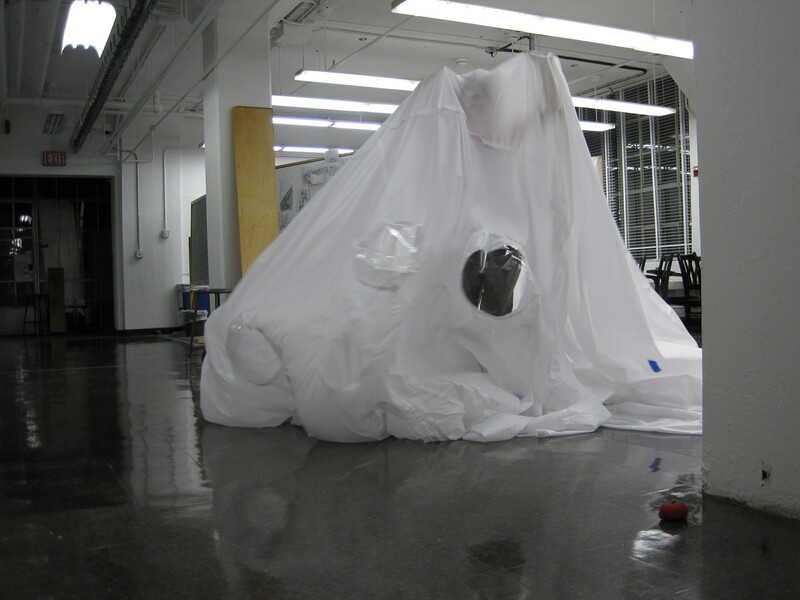 An amazing translucent egg found on the site "Design Considerations for Inflatable Structures". Click on this image to link to the site. 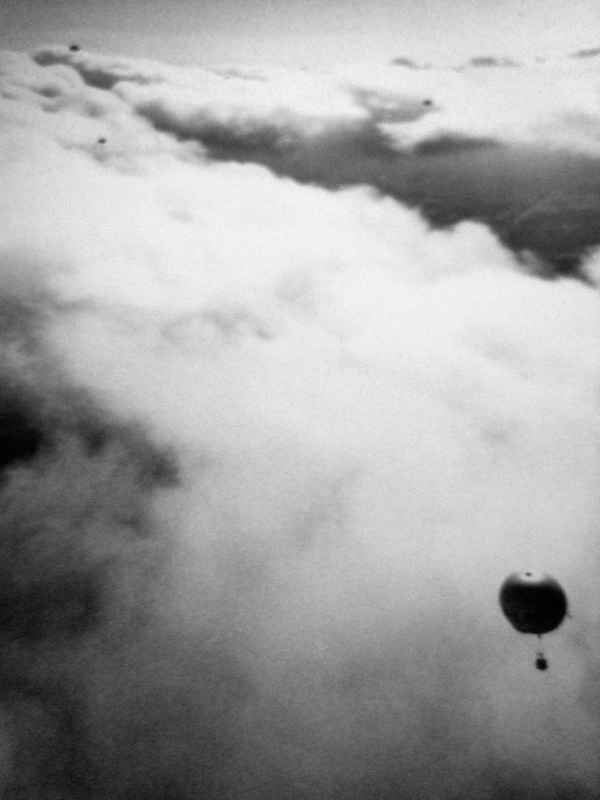 Cuschicle, by Michael Webb. I first saw this in a lecture by J. Meejin Yoon at the MIT Visual Arts Lecture Series. 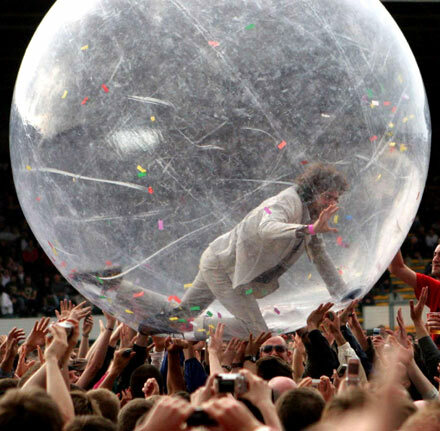 A Flaming Lips Concert. Click to watch video. In fact, that cape is a wall. Earlier in the evening, another exhaused person stopped by to say hello. Here is Erica Weiss, taking a nap with the first pinned bodysuit.